NOTE: This is a long, information-packed article on Sacred, Spiritual, Biblical Crystals: The Breastplate of Aaron. To make it easier to navigate, use the Table of Contents button to your right! The power behind Earth's minerals can be felt the minute you put a crystal in your hands or near your physical body. Crystals are the treasures of the earth. These stones are filled with energy to be used. Although all crystals are considered sacred in my eyes, there are several with great symbolism. The Breastplate of Aaron is of interest to crystal lovers because it is an early account of the use of crystals for both symbolic and decorative reasons. The Breastplate of Aaron, who was High Priest of the Hebrews and brother of Moses, was of great importance because by means of it, God revealed his Divine will to His chosen people. It was designed by God Himself and the directions as to how it was to be made were given to Moses (as illustrated in Exodus 28.) The original association of a special gem with each month was recorded in the Bible (Exodus 28 and 39). The twelve gems in the breastplate were later linked with the Signs of the Zodiac and later still, associated with the months in the year. 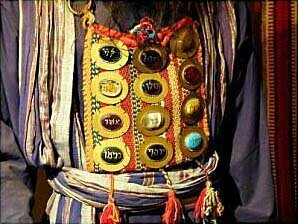 Upon the breastplate were set four rows of precious stones, three in each row, and upon them were engraved the names of the 12 tribes. In the first row there is a ruby, a topaz and a beryl; in the second row a turquoise, a sapphire and an emerald; in the third row a jacinth, an agate and an amethyst; in the fourth row a chrysolite, an onyx and a jasper. The exact identification of some of these gemstones are uncertain. For instance, it is important to realize that there are other forms of beryl such as aquamarines and emeralds. Sardonyx is a form of onyx, and jacinth and chrysolite are also known respectively as zircon and peridot. In the revised Standard Version of Exodus, diamonds, sardius, and carbuncle (an alternative name for the garnet) are also included in the list of twelve biblically significant gemstones. To recognize a power that is greater than our own is to recognize our Spirituality. We understand the mind/body relationship to be inspired by alignment with one's Highest Spiritual Principle and by that awareness we can choose Truth. Spiritual health is often considered a condition marked by a diminished sense of fear and the daily experience of unconditional love, joy, gratitude, and a personal relationship with your God. Religion can play a part in guiding us to the path of Spirituality. BUT, religion is simply a bridge to Spirituality. There are many religions, but only one spiritual truth. This spiritual truth is the journey home to your Self; and the understanding of your emotional courage, truth, and honesty. What is important in life are the good works of love that we do for others. Spirituality means shining a light into the darkest corners of our world and developing our capacity for compassion for those who are suffering and working for justice for all. Surrendering to our higher powers so that your Spirit can orchestrate the infinite correlation of details that are necessary for the manifestation of your desires. These are the benefits you'll receive when you surrender to a higher power. Remember, spiritual lessons are encrusted in our daily life experiences as jewels. They are made available to everyone who wishes to pay attention and listen. Crystals have the uncanny ability to transcend all human behaviors and negative emotions and teach us lessons of patience, insight, and acceptance and connect us to a higher source than ourselves. Crystals and our spiritual search take us deeper, higher and allow us to be more introspective. They bring us deeper inside so that we can then see clearer and make the journey upward and outward. They can help us to follow the light of purity, kindness and allow us to make that final connection to our brighter, open, more aware selves. Amethyst: For many people deepened spiritual growth is a primary goal. Amethyst is a helpful stone in realizing spirituality. Amethyst is a transition stone; it bridges physical and spiritual consciousness. Iolite: is the stone of prophecy and amplifies spiritual abilities. Labradorite: allows for the access of prophetic dreams and altered states of reality. This gives us the ability to reach in to our dreams and interpret their spiritual significance. Lapis Lazuli: helps us to strengthen our intuition and reinforces our ability to follow it. Kyanite: This is excellent for stimulating old beliefs, which no longer serve us. Kyanite reminds us that everything happens is for a purpose and that we are ultimately in charge. As we begin to look at the events of our lives in this perspective we can find that beliefs, which we accepted as fact, are brought to the surface. Moldavite: This is excellent for surfacing and dissolving old beliefs. This stone share telepathic access to spiritual laws, info from higher regions and places in order to help us to be healthier and more spiritual. Clear Quartz: This stone is a helpful stone in realizing spiritual growth. Part of spiritual development is knowing who we have been and deciding who we want to be. Clear Quartz can assist in the spiritual development and healing. Crystal healing can also be used very effectively for improved mental, emotional, and spiritual health. Read our article on Stone Correspondences for even more information on using crystals for healing. Agate: This stone is made of tiny flecks of quartz in ribbons. It is waxy and soft and always translucent. It helps to build self-confidence. Also, it helps with left and right brain balance. Amazonite: This stone is representative of prosperity. It helps to open the heart, throat, and solar plexus chakras. It increases your self-esteem and helps you to communicate better. Amber: Clear or orange petrified tree sap is the charm of this stone. It helps in past life work. The stone gives the person mental acuity, confidence, and a balance in their thinking. It can help with depression and bringing forth a positive attitude. Amethyst: This stone is for dream recall. It can help enhance psychic abilities. It reduces nightmares when worn at bedtime. It is considered the master healing stone. Aquamarine: This beautiful stone has the calming energy of the sea. It can be used for protection when traveling, particularly if you will be on water. It helps to clear blocked communication and assists in verbal wording. Aventurine: Spiritualists have long held that Aventurine has the ability to ground the spirit and bring balance to male and female energies. Its capacity to calm a troubled spirit or mind and bring an inner peace make Aventurine a very important stone in the spiritual realm. This stone is known as the “heart soother” and is used on the Heart Chakra. Beryl: This stone helps in filtering out distractions, relieving some stress, and can help to bring peace to your mind. Most times, these stones are used for harmony and balance. Bloodstone: So named because this stone was at the foot of the cross where Jesus' blood dropped on it. It is used for calming and tranquility. It attracts good luck and is correlated to honesty and integrity. Calcite: This crystal comes in many vibrant colors. It is used with the joints, cleansing the organs, and helping with memory. This stone will keep you anchored and help you feel comfortable no matter where you may be. Chiastolite: The “Cross Stone”. This crystal is a variety of Andalusite. It exhibits the axis and angle in a different color from the rest of the crystal forming a natural cross. It is used as a sign of devotion towards awareness and dispels negativity. It signifies both death and re-birth and helps one to understand the realization of immortality. It is used as a bridge for “crossing over”. It helps one to assimilate during times of change. It provides insight to answers when problem solving. This powerful crystal balances one's perspective in both creativity and practicality. During illness, it helps to maintain spirituality, lessens fever, balances blood flow, increases secretion of milk in nursing mothers and repairs chromosome damage. Citrine: A versatile stone, this one is mostly used for mental and emotional clarity and memory issues. It never has to be cleansed of negative energy, because these stones are quite positive. Most importantly, it can help us rid those negative feelings and assist us in accepting events the way they are. Diamond: Ignore the monetary value and look at its properties. With other stones such as aquamarine, it can actually boost t stone's power. Some say that the blue inside the color spectrum of the stone can actually help with glaucoma. It was used as a detoxing stone in ancient times. Dioptase: A deep blue-green crystal, it helps the heart chakra release negativity and heal itself. It promotes sincerity and emotional balance and its healing can go deep into the earth. Emerald: A symbol of love and good luck, this stone is used for harmony and peace. It also helps with depression and insomnia. Fluorite: This stone has every color of the rainbow, usually translucent in appearance. It is used as a balancing stone. The stone is also used to heighten psychic ability and spiritual connections. Garnet: Ranging in a multitude of colors, this stone heightens creativity and helps with the circulatory system. The brighter the stone is, the better it will work for you. It is used for help with exhaustion, strengthening blood, hormone balance, and fertility. It also helps us open up to others. Geodes: These are rock like on the outside and contain a crystalline structure on the inside. They usually contain forms of quartz, amethyst, and citrine. It helps with pursuits of math and assists in the decision making process. Gold: This is an all purpose type of gem. If placed in the sunlight for a time, it will become positively charged. It can help with degenerative diseases and chemical imbalances. It imparts an assertive energy to the wearer. Hematite: This shiny stone is used for grounding and encourages survival instincts. It also helps to enhance memory, give mental clarity, and give the wearer a sound sleep. It deflects negativity and restores balance. It was used by the ancient Egyptians for hysteria and anxiety. Iolite: This stone is a bluish lavender color. It represents truth, peace, and living at a higher awareness level. It is one of the best stones to use in psychic healing and spiritual activities. It can help open your psychic abilities and expand upon them> It is mostly used for meditation and astral travel. Ivory: Use this stone ONLY if you are drawn to it as it comes from elephants and walruses. It is used in the ailments of bones and joints. It will help make you become more in tune with animals and nature. Jade: This stone is used for health and wealth. It sends out a gentle, steady healing energy. It comes in a variety of colors and can be used on the chakra that corresponds with its color. This stone can help mellow your existence and rid you of negativity. It is a very protective stone. Jasper: This stone will work for practical solutions in your life. Its energy is used for grounding and protection. Jasper comes in a rainbow of colors. Native Americans used Jasper to help them connect to the spirit world and protect them while the traveled. Kyanite: Used for grounding and tranquility, this stone comes in several colors. It is used for visualization, dream interpretation, and meditation. It is also said if this stone is carried around in the pocket for a time, it will align all the chakras back to where they are supposed to be. Labradorite: Usually a metallic iridescent stone, it helps the wearer to share their strengths with the people around them by helping them to relate better to others. Don't clean this one with salt. Malachite: This stone has a steady flow of electromagnetic energy. It is used in healing and can clean the auric field by absorbing negativity. Place in all four corners of a room to cleanse of toxins. The stone must be cleansed daily. It will also help to amplify the positivity in your life, so use when you are feeling down or depressed. Meteorite: A solid brown to black mottled stone, it helps with greater awareness of your surroundings. These stones are in tune wit the cosmos' energies and can help raise our own energies to a higher level. Moonstone: This stone comes in a variety of colors. It honors the Goddess in all women and also aids in dieting, meditation, and Psychic awareness. It can help give us greater flexibility and calmness in our lives. Nephrite: This stone has creamy type colors. It has a steady energy and helps to mellow one's existence. It can also assist the wearer in ridding themselves of negativity. It is a protective stone and helps the body filter out any toxins. Obsidian: This stone is formed when hot lava is poured into water. It has a strong grounding property and reduces the need for escape from life. It help to dissolve anger and fear and converts it t flexibility. Onyx: This stone helps to balance and ground the wearer. It is used for centering the person to connect with higher powers. It can help to banish grief and enhance self control. It also brings balance to the body and good for people under mental and emotional stress. Opal: This sparkling stone amplifies feelings or buried emotions. It gives us the ability to be more spontaneous. It is a very fragile stone and will crack in the sun. It can also help to balance the left and right brain. Pearl: These stones are symbolic of a pure heart and innocence. It is used in balancing the emotions. It is a very nurturing stone, but it will hold negativity until it can be cleansed. They help to stabilize the mind and stimulate the heart. It is also said pearl powder can be used on the skin like a skin cream for wonderful effects. Peridot: This stone is a visionary stone and is used for health and wealth. It assists us in connecting to our destinies and in understanding the purpose of our existence. It can help the body release toxins and with mental cleansing. Petrified Wood: It is said to help the skin and muscle tissue. This stone helps you become more aware of all things in nature. It also can assist the wearer to connect with past life experiences and issues and bring them to light so they can be dealt with in this life. Quartz: There are so many different kinds of Quartz and in a rainbow of colors. It is known as the most versatile healing stone. It is used for harmony and sending guidance to others. The stone is also used in balancing the Aura. Rose Quartz is said to amplify the love of life to others from the wearer. Rhodonite: Tis is called the stone of love. It calms the heart and helps with grounding and balancing. It will allow us to focus on tasks and gets rid of confusion. It can also help in spiritual healing and communication. Ruby: This deep red stone helps with blood sugar levels and re-energizing after going to exhaustion. It will amplify the wearer's positive and negative energies, so be careful. It can also bring anger to the surface very fast. The stone will help with healing and enhances the psychic ability and insight. Sapphire: A dark blue stone, it helps in communication, insight, and intuition. It is most strongest when placed next to the skin. It helps to lessen tension and align the physical, mental, and spiritual realms. Black Sapphires are the most protective. Selenite: This is a type of gypsum stone with white striated crystals. It is used to work against the effects of cancer and helps to stabilize people that have epileptic episodes. The wearer must visualize the warm light bringing energy and healing to them. It may also help with issues of letting go. Silver: This shiny stone can help wit issues of mental and emotional cleansing. It helps by giving a balance to your emotions. The stone is good for those with diminished memory and irrational fears. It is a less assertive stone than most others. Sodalite: This crystal is recognized for its healing and meditation powers. It can help the wearer express themselves better due to the connection with the Throat chakra. It can assist you in being more objective and less critical of others and everyday happenings. Stuarolite: Fairies' Cross: Historically, this stone is said to be formed from the tears of fairies when they were brought the news of the death of Christ. This stone is said to provide a connection between the physical, astral and extra-terrestrial planes. It can provide an overpowering “release” in stressful situations and provides support, initiation and incentive in dealing with detrimental habits. Formed in the shape of a cross, this amazing stone is beautiful and powerful on your alter or meditation space, around your neck or in your pocket. Tanzanite: This is a rare blue violet stone. It is a stone of magic that accentuates spiritual awareness and insight. It is also used in relieving depression. So named because it was found in Tanzania, this gorgeous stone helps to dispel negativity. Tiger's Eye: This stone is widely recognized an is used for money, courage, and luck. It amplifies thinking and helps you to bring your ideas to reality. It is used for centering and grounding and helps us recognize our strengths and weaknesses. It was known as he true balancer of Yin and Yang in ancient China. Turquoise: Modern Spiritualists consider Turquoise to be a stone of spiritual attunement, cleansing, protection and prosperity and a symbol of the Earth and sky, good fortune and success. Native American's see turquoise as one of the most important holy stones in their belief system for protection of the body and soul. Most Eastern cultures regard Turquoise as a powerful protector and in general, a very lucky stone. The religion of the Hindus said that it could accumulate wealth and Tibetans believe that while turquoise can ensure good fortune, it can also guard one's health, and protect against the evil eye. Zircon: This stone comes in all colors, but is a clear crystal most of he time. It helps the wearer to see universal truths and have a connection with all that is. It helps to relieve depression and insomnia. It also was used back in history as a poison detoxifier.